These are the gifts you need. It’s that time of year: Punch recipes get broken out, decorations are dusted off, and people are in a more-festive-than-usual kind of mood. Yes, it’s party season, that circuit of boozy evenings hosted by friends, co-workers, and friends of friends. And sometimes showing up with a bottle of wine just isn’t enough: Given all the trouble those people go to just to make sure you have a good time — not to mention the after-party cleanup — you are right to feel (gently) obligated to give them something back to show your gratitude. Or maybe you just need to bring something edible to the party for your host and fellow guests to enjoy. Grub’s got you covered. 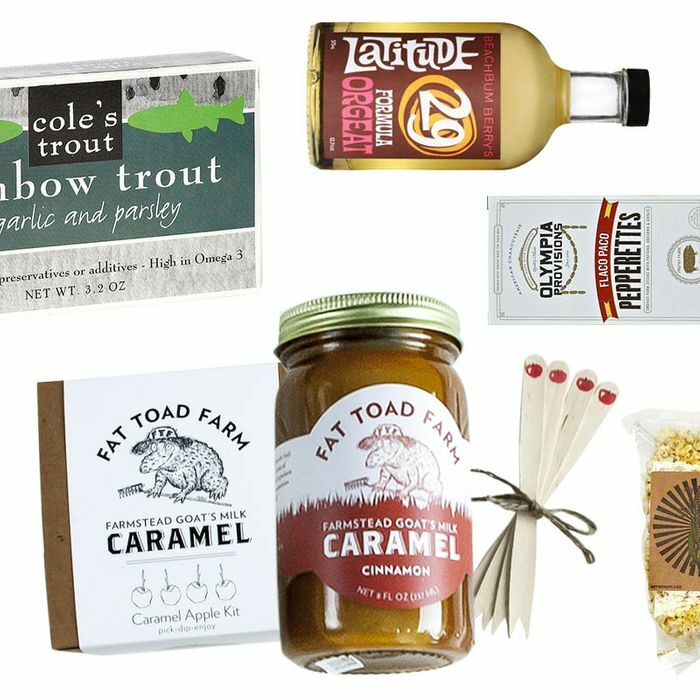 Here, a dozen options to consider bringing to your next party as thanks to your host, from bespoke popcorn for everyone to snack on to fancy pizza rolls and top-notch trout in a tin. If you’re assigned the task of bringing a snack to the party, popcorn is an obvious choice: It’s widely loved, ideal for sharing, and even better after everyone gets a little tipsy. This corn is popped in a solar-powered kettle and given an unexpected kick with the addition of yeast. This snack from Charleston, South Carolina’s Callie’s Biscuits one-ups classic crackers by actually incorporating Vermont sharp cheddar into the flour, along with some butter and spices for good measure. Vermont Creamery’s marquee product is this ash-ripened and aged-chèvre-like winner. At six ounces, it’s just the right size for a gift. You could get all fancy with your olives, buying ones infused with orange essence or what-have-you, but, really, few things beat classic stuffed olives. For this version of the cocktail-party classic, Rioverde takes hefty queen olives and stuffs them with hot guindilla peppers for a kick. Olympic Provisions is one of the country’s top producers of cured meats, and these ready-to-eat sausagelike snacks come in three flavors: juniper and sea salt, caraway and coriander, and paprika and garlic. Just get one of each. Rhode Island–based Cole’s produces some of the most impressive tinned fish this side of the Atlantic. A recent addition to their lineup, this option starts with sustainably raised rainbow trout and packs it in olive oil with garlic, parsley, and sea salt for good measure. This isn’t so much for the party as it is for your host to enjoy later. Caramel apples are as nostalgic as it gets, and this DIY kit features an eight-ounce jar of excellent cinnamon-spiked goat’s-milk caramel and sticks for making their own. Here’s something good: a bottle of versatile, fragrant oil that, until this year, hadn’t been commercially produced in almost 200 years. Spurred by influential Southern chefs like Sean Brock, Georgia’s Oliver Farm makes this oil with benne seeds from Anson Mills. Another great Southern staple: Something like Dixie’s answer to maple syrup but more like molasses or honey, sorghum syrup is made from the grain of the same name. It’s rich and sweet and a versatile ingredient that can be used in both savory and sweet dishes. Holiday season means punch, hopefully of the tiki variety. This orgeat — the almond syrup essential to tropicals drinks — is based on the Trader Vic’s recipe and used at Latitude 29 in New Orleans. It’s also a cocktail staple your host probably doesn’t already own. Everybody loves a throwback, and Roberta’s Bakery has unleashed next-level pizza rolls on New York, made with crisp pepperoni and three kinds of cheese (parmigiano, mozzarella, and caciocavallo) and served with marinara sauce. Nobody at the party will dislike that. Court Street Grocers, which recently expanded to Manhattan, is best known for their sandwiches, but the team also serves some fine homemade sweets. Get this oversize spin on the classic American treat, instead made with the old-school General Mills cereal Quisp. They’re sweet, a little corny, and perfect for tearing apart or, if you want to be more civilized, easily broken up into small, bite-size pieces.